With a design resembling a folding picnic chair, the Miguel Cat Tower is not an ordinary feline contraption. It’s a multi-function tower that features a handful of innovations that will make Felix or Garfield healthy and happy. 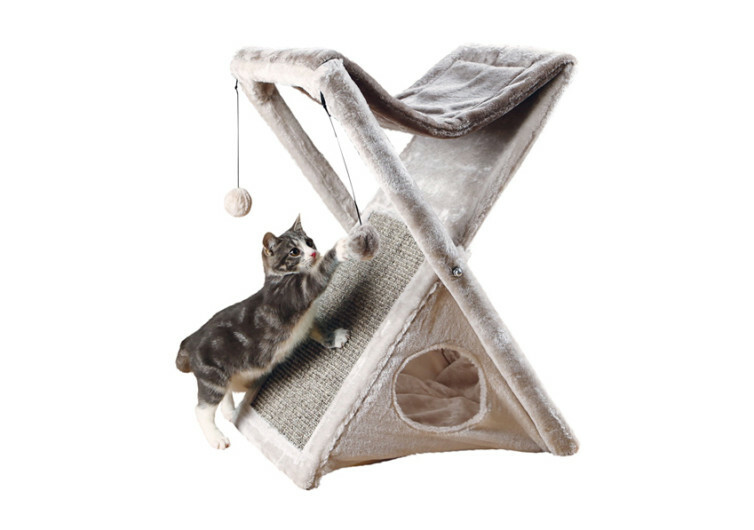 It’s a cat perch, a feline playground, a scratching platform, and a cat’s den all in one beautiful design. The Miguel Cat Tower is a folding feline condo that follows the design of a conventional folding picnic chair. The X-frame legs come with plush covering for more comfortable handling. You can fold it with ease and you’ll never complain of a hard surface hurting your hands. The soft plush cover also helps prevent scratches on your floor. You get to maintain the integrity of your home surfaces while giving your kitty a nice place to stay, scratch, and play in. The upper section of the Miguel Cat Tower comes with a hammock-type of bed. It has a soft and smooth surface that is perfect for cuddling your feline’s body. It is not as high as a real cat tower so your cat may not enjoy the view of the backyard. It still makes for a comfy perch for your cat to rest on. It’s also a great crow’s nest, allowing your cat to get a good vantage point for critters that may be crawling below. It’s the perfect platform for springing a hunter’s surprise. The upper legs of the Miguel come with two dangling balls. It’s what your pet can swat or swipe for fun. You may want to replace the soft, furry balls with your cat’s own toys if you want to. At least you’ll be sure your pet will have a good time playing before heading up to its perch. On the panels of the legs is sisal scratching surface. You know how cats love to scratch as it allows them to sharpen their claws for hunting duties. It’s a good way to stretch their backs and limbs, too. 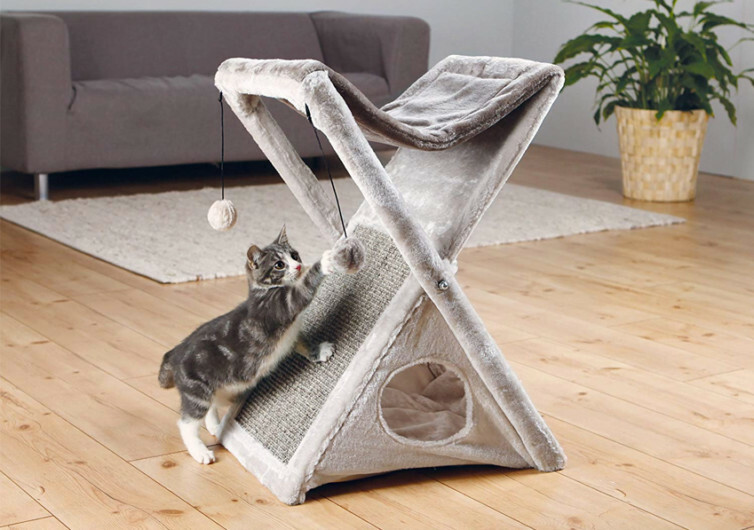 With this contraption from Trixie Pet you’ll be saving your furniture from cat scratches. After playing and scratching, your cat can fall sound asleep inside its den. It comes with a comfy cushion to make feline sleep more restful. You may need to wash the insert by hand, though. The Miguel Cat Tower may not stand tall like other towers, but it sure can provide a number of features for a happier and healthier cat.